This dessert is a crazy mixture of several other desserts. There is a layer of very chocolatey brownie. Then there is a rich cheesecake, flavored with coffee. 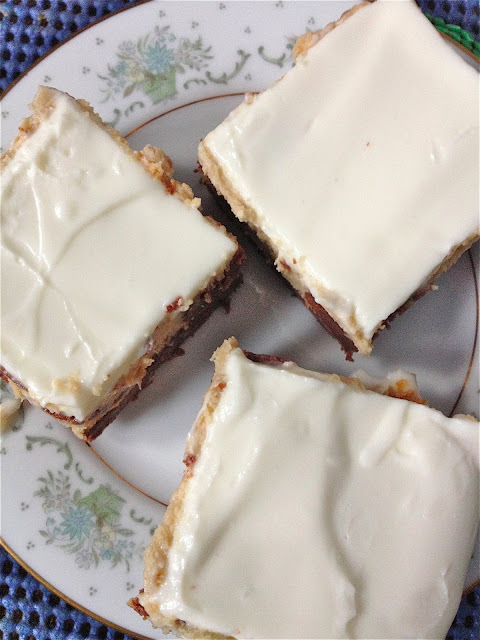 To top them off, there is a sweet-tart layer of sour cream. Combining flavors is a risky business. You never quite know what will be delicious and what will fall flat. And the more flavors you combine, the greater the chance that you will choose one that people don’t like. As a result, I wasn’t able to give these brownies away very quickly. 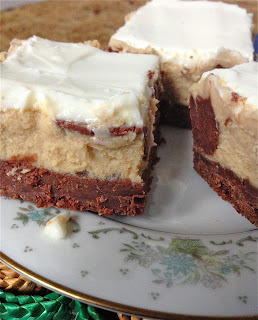 Coffee haters and cheesecake haters both spurned these brownies. For me, this dessert was a dream come true. I love coffee, I love chocolate, I adore cheesecake (especially in small amounts), and sour cream was literally the icing on the cake. I occasionally get into hot cocoa grooves. I can go months and years without drinking hot cocoa and then, one not-so-special day, I must have it. I’m admittedly food snobbish about many things, but not hot cocoa. One day, I tried to be. 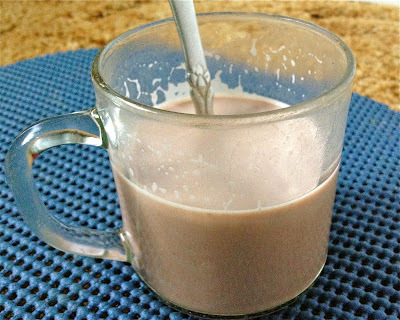 I decided to melt bittersweet chocolate and add some milk, making a thick concoction that was undeniably delicious. However, it was so rich that I threw up. Yeah...cool story, right? Since that unpleasant experience, I have preferred a less rich, very milky hot cocoa. 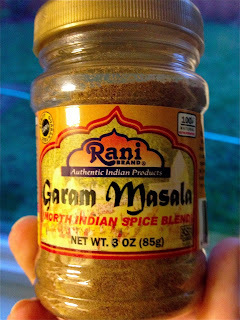 Something that resembles the kind made from a mix, but without the trip to the store. Since I usually keep milk and cocoa on hand for baking, this recipe is perfect for a one-off hot cocoa craving. Without the vomit. 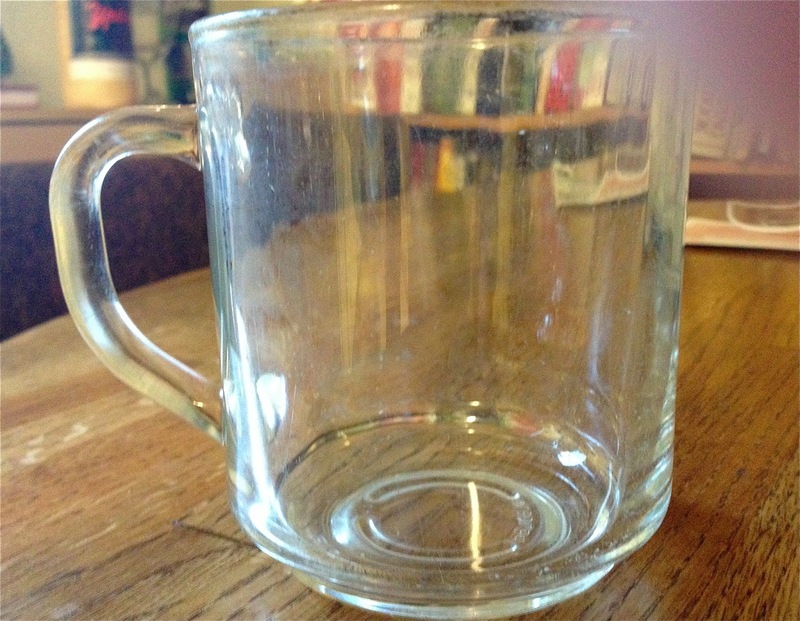 Combine cocoa, and sugar in a microwave safe mug. 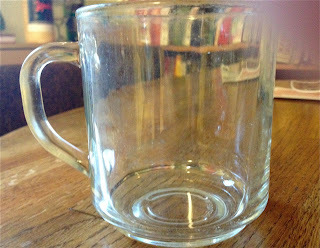 Pour over water and stir. Microwave on high for 30 seconds. Add milk and stir to combine. Microwave on high until as warm as you like (about a minute on my microwave that is from the the 80s). Add a drop of vanilla extract. Stir one last time. Serve with marshmallows or whipped cream, if you like. Roasting a chicken makes me feel like the most powerful kitchen wizard, and it isn’t even that difficult. 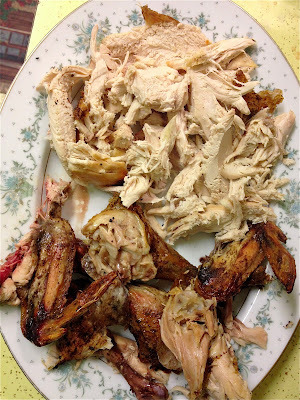 You could sum it up in just a few words: Put chicken in 400 degree oven. Take out when the thigh meat is 180 degrees Fahrenheit (about 90 minutes). Eat. My blurry chicken. I got excited and ripped off the legs in joy. If you don’t know how to season the bird, just stick with poultry seasoning. 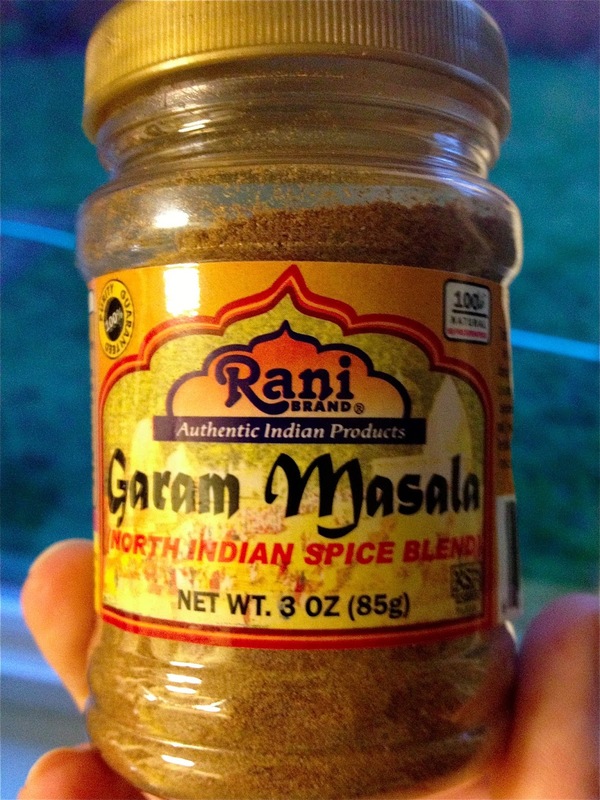 I made this chicken with garam masala, a north Indian spice blend. 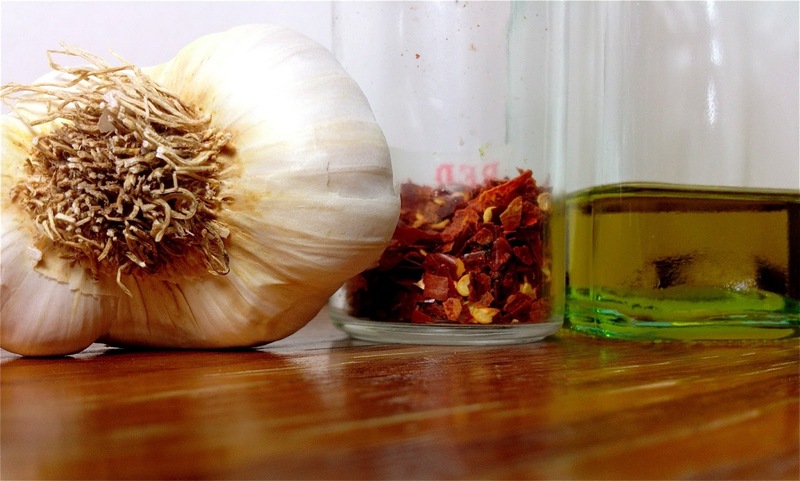 It takes the guesswork out of seasoning, and you can experiment with spices as you learn to combine them. This is a trick that I picked up doing tissue culture in the lab. You keep one hand clean, and use the other to touch possibly contaminated items. While prepping the bird, use your clean hand to grab the salt shaker, the spice mix, the lemons, and the like. Use your dirty hand to rub them around the bird, lift the bird up and rotate it, etc. When you’re finished, wash both hands with soap and very hot water. This prevents poisoning yourself and others with salmonella. I’m still working on perfecting a method to produce perfectly cooked veggies on the same time scale as the chicken. What I do know is that you should stir them up a bit every half an hour or so so that they cook evenly and are evenly moistened with chicken juices. You can use foil to wrap up the ends of the legs and the wings up with foil if they start to get too dark. This seems easier than tucking and tying that some recipes make you do to keep the extremities from burning. Roasted chicken and veggies are only made better with a moist sauce to add more intense flavors to their own. Gravy is the classic choice. I’m still figuring out how to make a good gravy from a small roast chicken. I usually make it from a mix. For this meal, instead of gravy, I made parsley gremolata by blending garlic, parsley, and lemon zest. A bright, herby sauce like this is a fresher, brighter alternative to gravy. 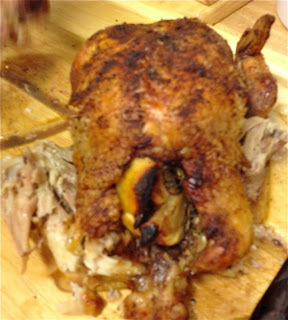 Have fun crafting tasty meals around a roasted bird! This month, I am gravitating towards comfort foods. Hot, steamy, mushy, salty comfort foods. Matzo ball soup is one of the most popular and well known comfort foods in the world. It originated in Eastern Europe, where dumplings are very popular. Jewish women made them with matzo meal, possibly to be kosher for passover or possibly because they just had a lot of matzo around. Whatever the reason for their invention, matzo balls taste amazing. Their popularity is well deserved. Prior to making it myself, I had tasted matzo ball soup only once in my life, when Sarah and I made it from a mix using some questionable egg replacer in place of the eggs. It was pretty good, actually. 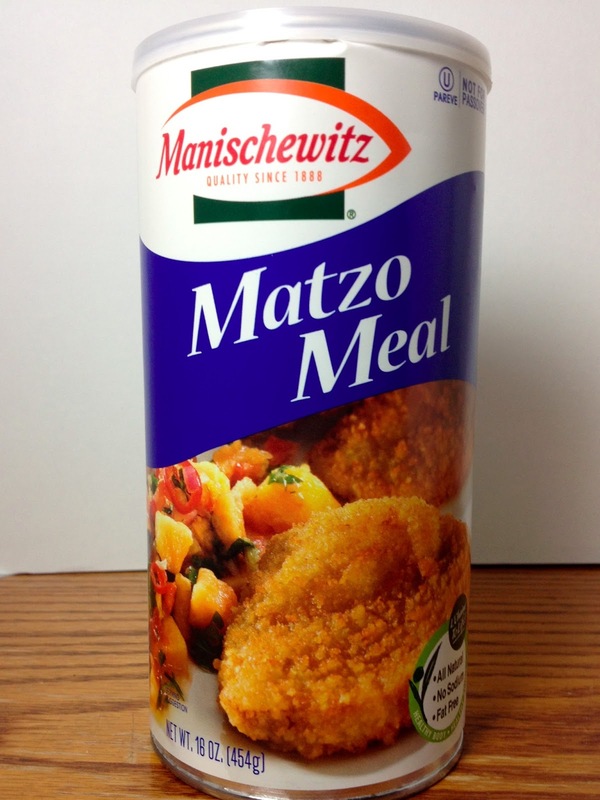 But to make it from scratch, the only non-pantry staple item you need to buy is matzo meal. Found in the Kosher/Jewish foods section. Then I made it myself, and I am officially hooked! Making it from scratch isn’t all that different from making the box mix. Matzo meal, salt, pepper, water, fat and eggs are mixed together. You chill the mixture for a bit, shape it into dumplings, and cook them. Then you add them to chicken broth, which can have carrots and other veggies added to it if you like. Pretty simple. When homemade stuff doesn't cut it, this is my secret weapon. I used leftover broth from my turkey soup. It wasn’t quite flavorful enough, so I added a little chicken bouillon. Is this cheating? Possibly. Did my tastebuds really mind? No. 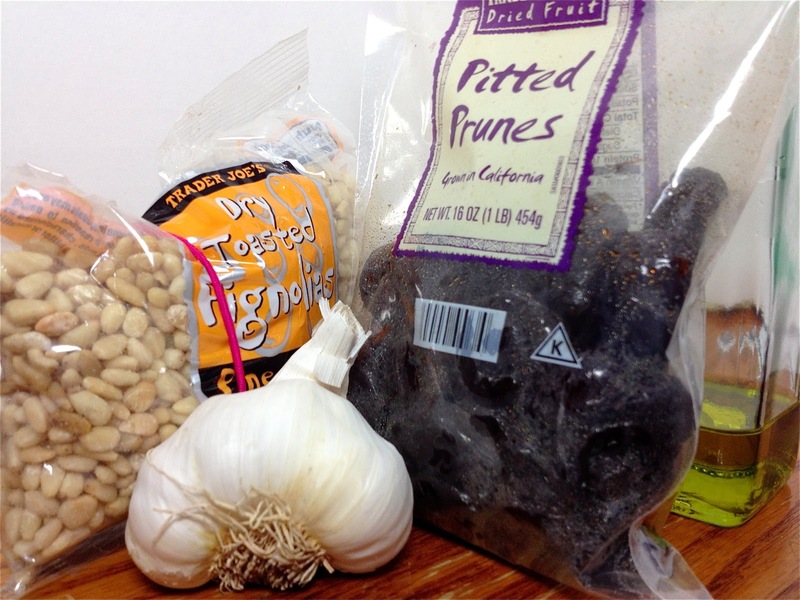 Mix the matzo ball ingredients together. Chill for 30 minutes. Bring a large pot of salted water to a boil and turn down to a bare simmer. Wet your hands and roll the mixture into balls about 1 inch in diameter. Carefully drop the balls into the simmering water. You may want to use a slotted spoon for this. Cover the pot and simmer for about 30 minutes. Meanwhile, bring the broth to a boil and turn the heat down to simmer. 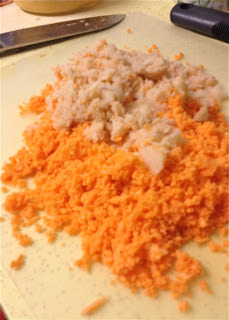 Add the carrots and simmer for 5-10 minutes (depending on how big your carrot pieces are). 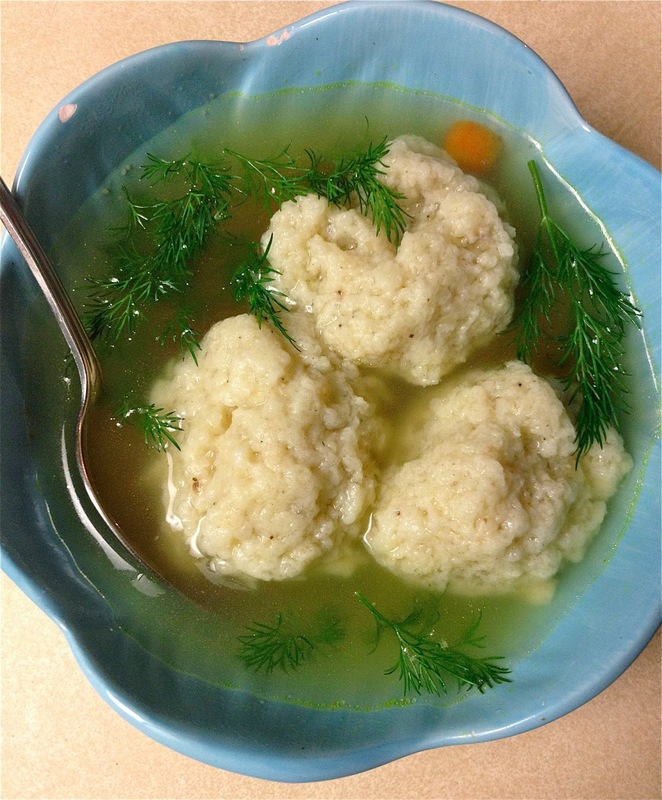 To serve, lift 2-3 matzo balls out of the water into a soup bowl. Ladle broth and carrots into the bowl, and top with a few pieces of fresh dill. Rachael’s note: Don’t worry if you don’t have enough broth. You can get by with less than two quarts if you aren’t serving many people. My rule would be about 2 cups per bowl of soup you intend to eat. Make more broth if you love broth, less if you’re more about the matzo balls. People will tell you homemade is the only way to go but canned/boxed broth or bouillon added to water both taste just fine to me! 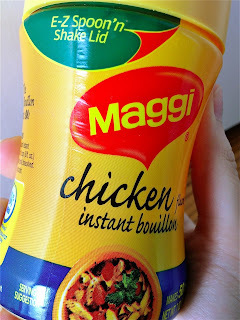 Disclaimer: I love bouillon. 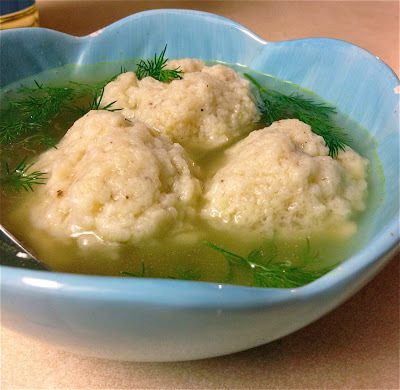 Recipe Source: Matzo Ball Soup from smitten kitchen. Arfa, Orit. “Thinking Outside the Matzah Ball Box” JewishJournal.com. 25 Mar 2009. Accessed 8 Jan 2013. “Jewish Cooking.” Judaism 101. Accessed 8 Jan 2013. You take that extra sip of water. You go chat it up with your buddy. You go chalk your hands, because you know sweaty hands must be chalked frequently. You lay around on your couch eating chocolates or watching t.v. Alright, reality check, taking obscenely large breaks during a workout are reserved for people who do balls to the wall olympic training. People who do olympic or competitive training, meaning those who sprint like a cheetah or can lift your car plus you in it. The disadvantages to taking long rest breaks (greater than 2 minutes) is that your heart rate falls from where it is supposed to ideally remain in a workout (depending on what you are trying to achieve, a 50-85% range for target heart rate). What’s the point of maintaining a target heart rate? Maintaining a certain number of beats per minute allows you to either be in a steadier fat burning state or cardio mode. So the next time you go for that extra five minutes to get some water or towel off your brow remember that you are robbing yourself of consistent training. A good rule of thumb I like to use is if you are able to have a full conversation while working out (as in you’re not working much besides your jaw from talking) then you should be dropping the chatter and working harder. It’s fine and great that people like to have a good time working out, but it’s going to take you much longer to reach your goals if you don’t make efficient use of your workout time. The other kicker is taking “rest” days. Yes, you should avoid overtraining, but a rest day is a far cry from helping you recover. What you should aim for is taking 30 minutes to an hour on recovery/rest days and stretching out, rolling out, gaining mobility and flexibility. If you don’t invest time in recovering progress in your runs, lifts, or jazzercise is going to be stunted. So ladies and gents, please consider how many rest breaks you take (limit them to 30 seconds-2 minutes absolute max) and actively recover your muscles for maximum performance. When you have a day to spend around home, slow cooking a sauce in the oven is wonderfully relaxing. You can do nothing while a lovely aroma spreads through the house, and you seem a kitchen hero to your family. 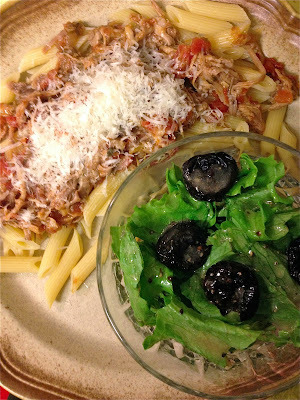 I recently made a pork ragu in this manner. 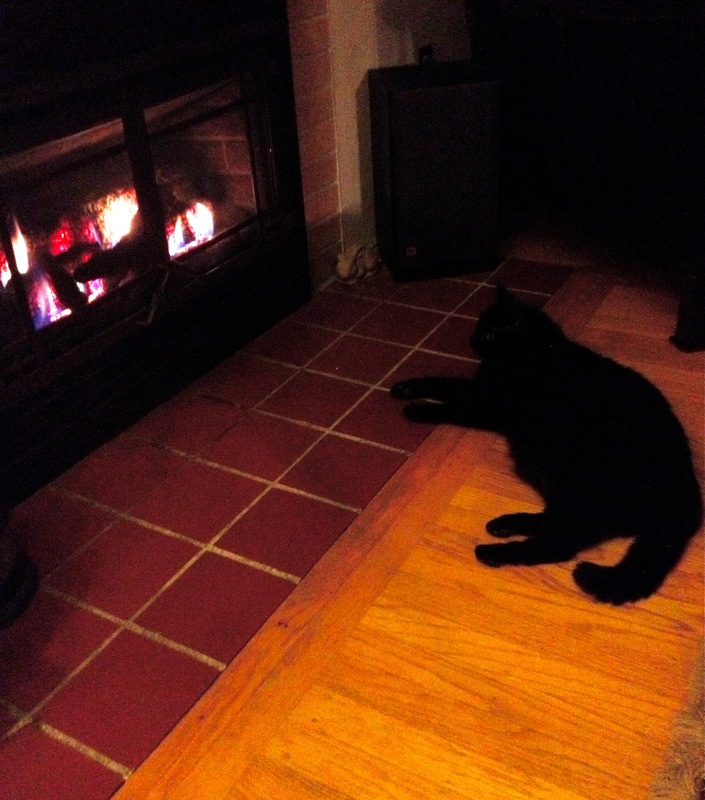 Lie in front of the fire while your dinner cooks itself! A “ragu” in Italian Cuisine refers to a meat based sauce. It can have tomatoes in it, but the meat is the main attraction. A tomato based sauce can have meat in it, but it isn’t a ragu unless it is mostly meat. So, the Ragu brand pasta sauce at the supermarket (while I’m sure it is delicious) isn’t technically ragu at all. 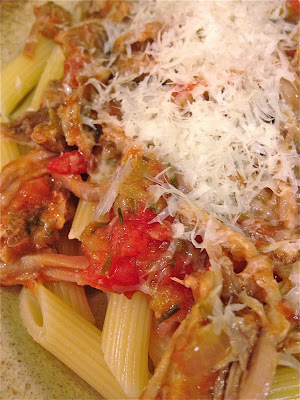 Even more technically, this ragu is a Neopolitan Ragu, in that is uses a whole cut of meat rather than chopped up into pieces. The whole cut of meat is a boneless pork shoulder. After 3 hours of braising, it was tender to the point of falling apart. The perfect main attraction for a ragu. 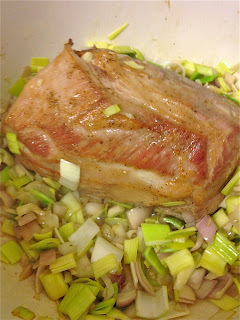 Browned pork shoulder, waiting for braising liquids. However, the pork needs a lot of support to make it delicious. It is flavored with shallots, leeks, tomatoes, red wine and spices. 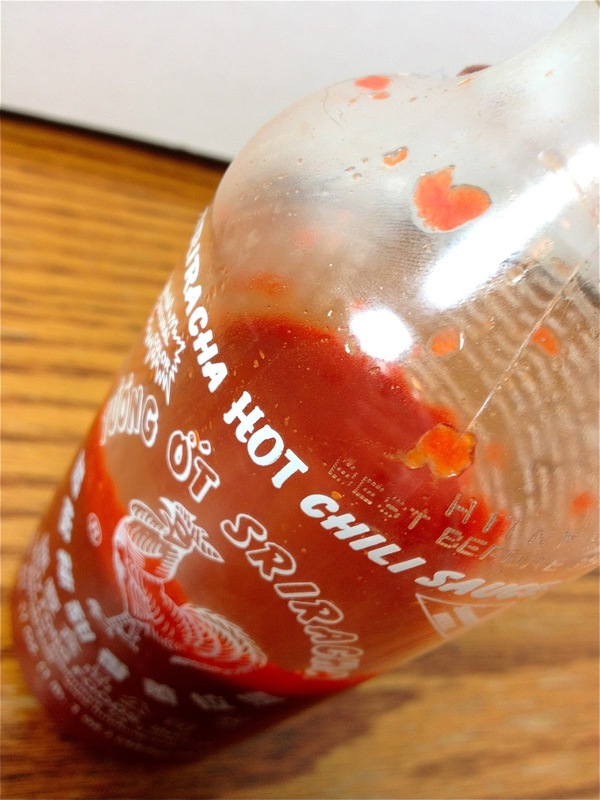 Most noticeably, there is a hefty dose of Sriracha hot sauce. The flavors that resulted were warm, comfy, and slightly spicy. 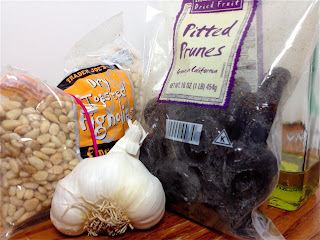 I served it over penne with an accompanying salad using my new favorite ingredient, prunes! 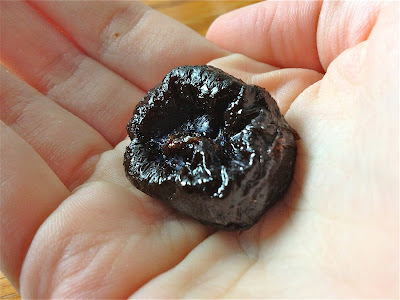 Prunes taste lovely in vinaigrette. They have been tainted by their use as a constipation treatment. They are so fruity and sweet. Anything fruity and sweet goes really well with pork! Pat the surface of the meat dry and generously salt and pepper it. Preheat oven to 325 F. Set a Dutch Oven over medium high heat. Heat olive oil and butter until butter melts. Add meat to pan and brown on all sides. 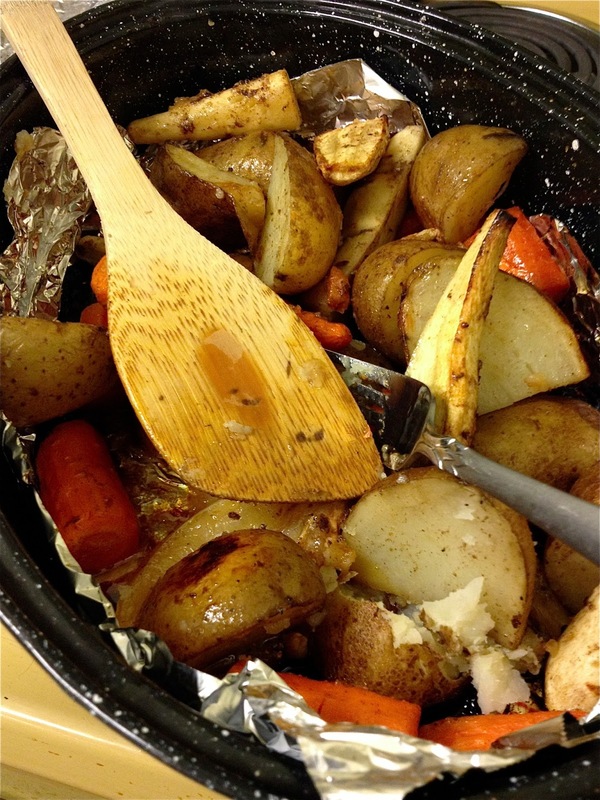 You may have to turn it to awkward angles to get the whole thing browned, but get it all; you don’t want any raw meat to contact your veggies. Add garlic, leeks and shallots to the pan. Toss them around to coat in oil and saute until softened, only a few minutes. Add tomatoes, wine, hot sauce, thyme, oregano and fennel. Liquid should reach about ⅓ the way up the side of the meat. 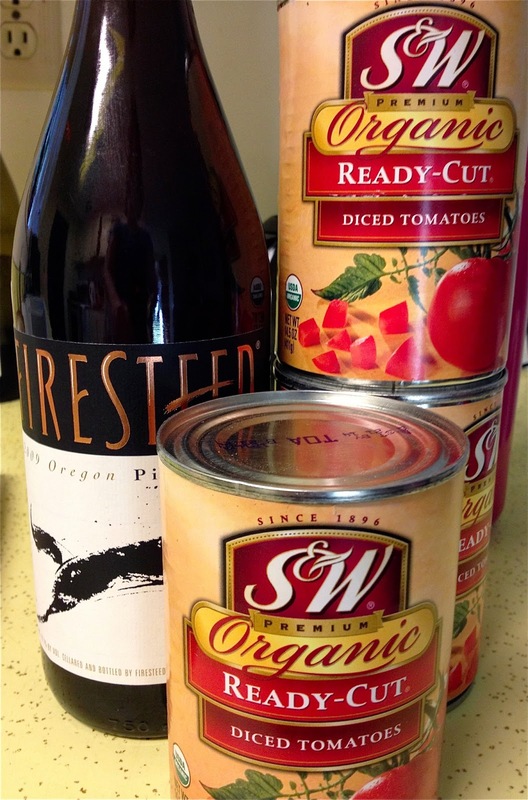 Add wine or tomato juice if necessary. Cover with a tight fitting lid and slide the whole thing into the oven. Cook for 3-4 hours, turning the meat over once an hour. I knew mine was done when I attempted to turn it over and meat slid right off. Remove the meat and shred with two forks. Return to pot and stir everything up. Taste and add salt, pepper or hot sauce to your liking. Cover to keep warm. Boil water and cook your pasta. Serve sauce over pasta and top with parmesan cheese. My routine with greens is almost always the same: garlic, olive oil, and red pepper flakes. I totally recommend it. 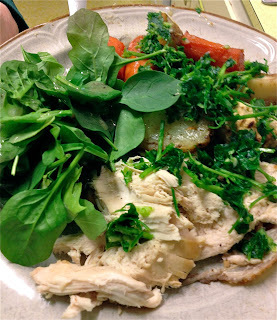 It tastes great every time, but I’m always looking for new flavors to try with greens. I don’t want to get bored with greens, they’re great for you! This week, I tested out the combination of Swiss Chard with garlic, prunes and pine nuts. Garlic had remain present because garlic and greens just go together. 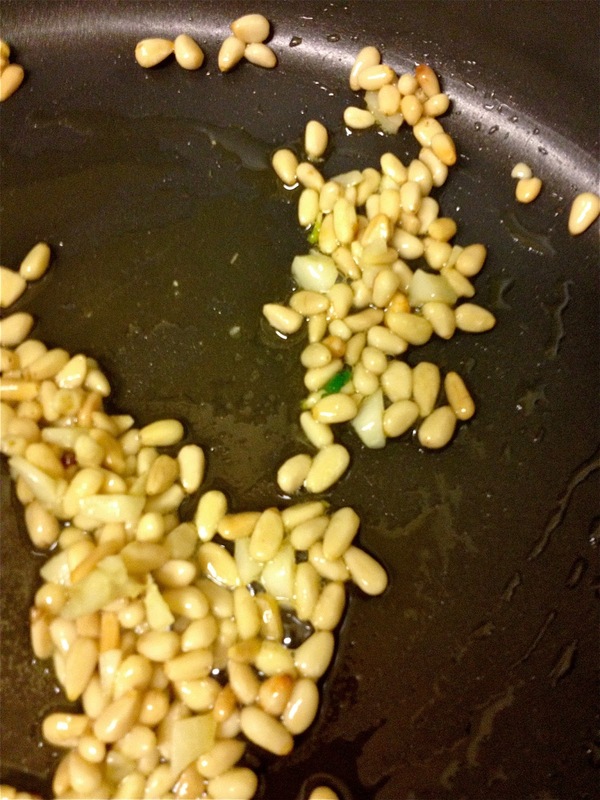 The pine nuts were predictably delicious, as they ought to be for their high price tag! I bought mine at Trader Joe’s, where they are pretty reasonably priced. You can also substitute pretty much any nut. Much to my surprise, my favorite part of this dish was the addition of chopped prunes! I hadn’t really eaten prunes before making this. I bought the bag for a baking project that I later abandoned. I always assumed they tasted like their puckery juice, but they didn’t! They were plump, sweet and chewy, a great contrast to the astringent plant taste of the chard. Rip the leaves from the stems of the chard. Discard the stems or save for another use. Wash the leaves by submerging them in cold water. Dry in a salad spinner so that they aren’t dripping wet. They don’t need to be completely dry, however. Heat olive oil in a saute pan over medium heat. Add garlic and pine nuts. Stir and cook for about 1 minute. Add chard and prunes. Cook and stir until chard is wilted, about 4 minutes. Sprinkle with water if the chard dries out and starts to get crispy. Remove from heat. Sprinkle with salt to taste to serve. 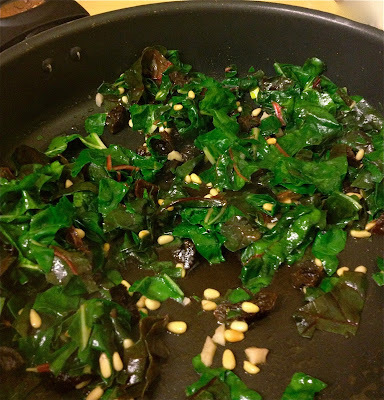 Source: My brain, I’ve seen 3 or 4 recipes for chard with nuts and dried fruit bouncing around the internet lately. Tomorrow, I’m going to clean my hair dryer. It's amazing how much more efficient a blow dryer is when the air doesn't have to make it's way through all that dust! Of course you can make ice cream! It’s right there in the name: ice+cream=ice cream. The awesomeness of homemade ice cream isn’t cost effectiveness (it’s more expensive), nor necessarily quality (you can’t quite recreate the smooth, easy to scoop industry texture at home). The awesomeness of homemade ice cream, sorbet, and frozen yogurt is this: You can do whatever you want to it. You can put literally anything you want in your ice cream. You can go wild. I once made strawberry ice cream using sour cream instead of cream. I froze thick homemade strawberry lemonade into a sorbet. Actually, those things weren’t that whacky, but they were certainly not standard strawberry ice cream! Maybe you’re more daring than I and will try something truly crazy. Hot sauce? Bacon? Curry? Garlic? Anything, my brave friend. This recipe marries blackberry and chocolate, and the marriage is a very happy one. It isn’t the craziest of combinations, but it is different from plain old chocolate! It is very dense, very rich, and delightful. Feel free to play around with it all you like. In a saucepan, bring milk and heavy cream just to a boil, and remove from heat. In a separate bowl, whisk together egg yolks and sugar. Whisking vigorously, very slowly pour the milk mixture into the egg-sugar mixture. Return the egg-milk mixture to the stove and set over medium heat. Cook, whisking constantly, until the mixture has thickened. When finished, if you take up a spoonful and run your finger down the bowl of the spoon, the custard should not fill in the track left by your finger. Place the chocolate in a bowl and immediately pour the hot custard over it. Let stand for two minutes, then gently stir the mixture with a spatula until chocolate is completely melted. Chill custard. 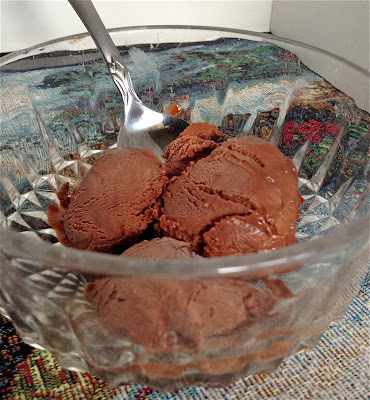 Freeze in an ice cream maker according to manufacturer’s instructions. During the last few minutes of churning, add the blackberry jam. 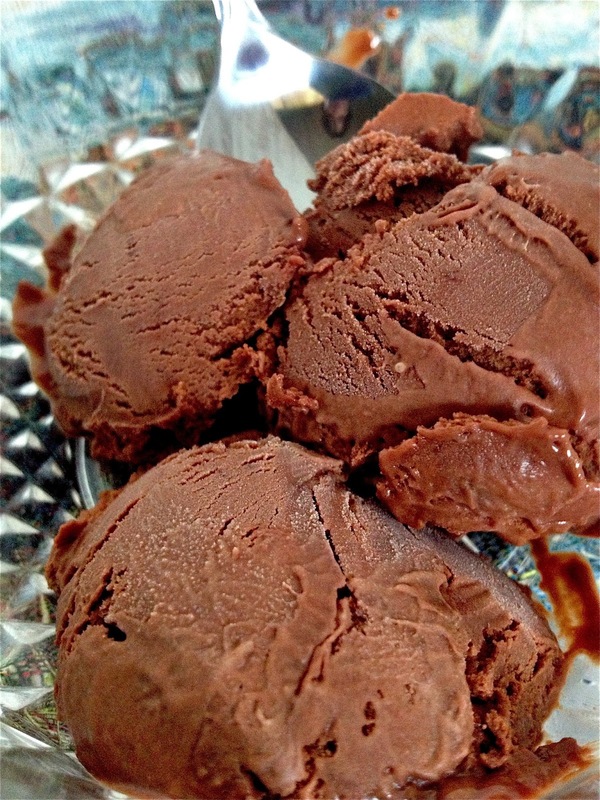 Pack the ice cream into a container and store in freezer for at least two hours before serving. Source: Adapted from “Unbelievably Good Blueberry Ice Cream” from Baking: From My Home to Yours by Dorie Greenspan. Waking up to a big hearty meal is truly satisfying. 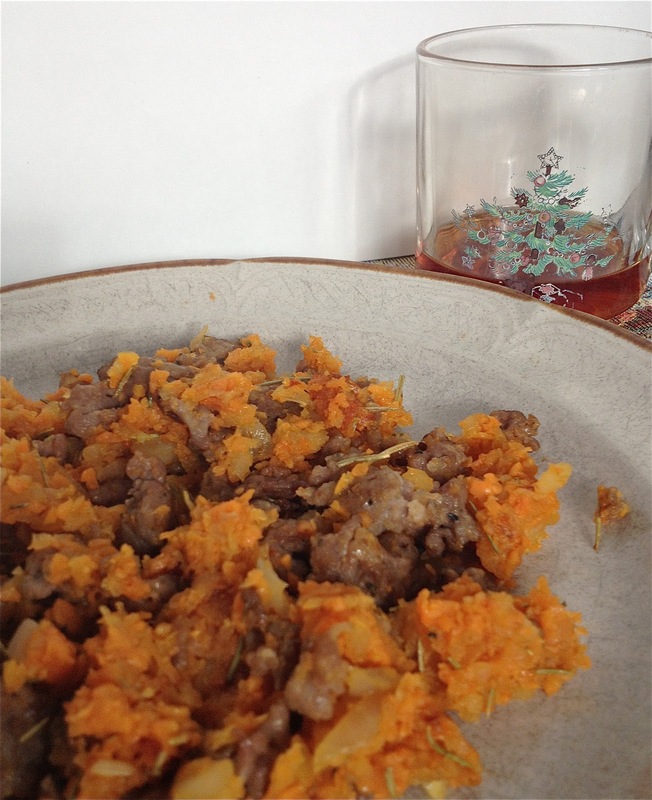 This plate of sweet sausage and steaming sweet potatoes was a huge dose of comfort on a rainy, dreary winter morning. I’m not usually in the mood to cook first thing in the morning, so a weekend brunch like this has to be either really fast or something you make the night before. This hash is of the “really fast” variety of brunch dishes. The main task is to peel and shred the potatoes. I shredded my potatoes in a food processor so that they would cook quickly. If you don’t have a food processor you could grate them using a box grater, or dice them. You could probably cut everything up the night before if you were so inclined. All in all, the whole thing took me about 30 minutes. The hash is really sweet, but I thought this paired well with coffee and tea. My boyfriend usually hates breakfast, but he gobbled this up! Heat a skillet over medium heat. Add sausage and cook, breaking it up into smaller pieces. Once cooked through, remove sausage to a plate. Add onion to skillet and cook in the sausage drippings until translucent. If you used lower fat sausage and don’t have much drippings, cook in a tablespoon or two of olive oil. Add the garlic and rosemary and cook for about a minute. Add the potatoes and give everything a stir. Spread the hash evenly in the pan and cook, undisturbed, for about 3 or 4 minutes. Then stir everything vigorously, spread everything out evenly in the pan again, and cook undisturbed for about 3 minutes. Continue cooking and stirring until the potatoes are tender. (It took me about three rounds of cooking and stirring.) Mix sausage in with the potato mixture. Salt and pepper to taste. Source: Based on the flavors of this recipe at theKitchn. 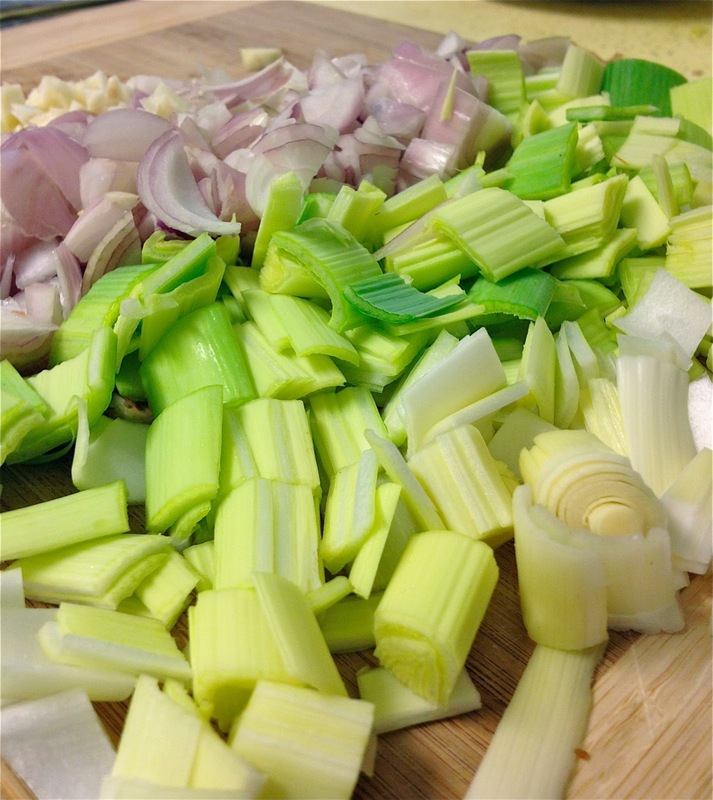 Eat Your Veggies is a pseudo weekly series featuring easy seasonal veggie recipes. 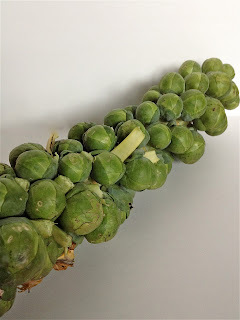 Brussels Sprouts, for some, conjure memories of being forced to eat bitter, mushy things boiled to death by a well-intentioned yet clueless mother. 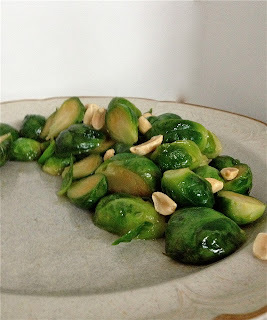 I think most people who dislike Brussels Sprouts must have had some experience like this, because everyone who hates them does so with unusual fervor. 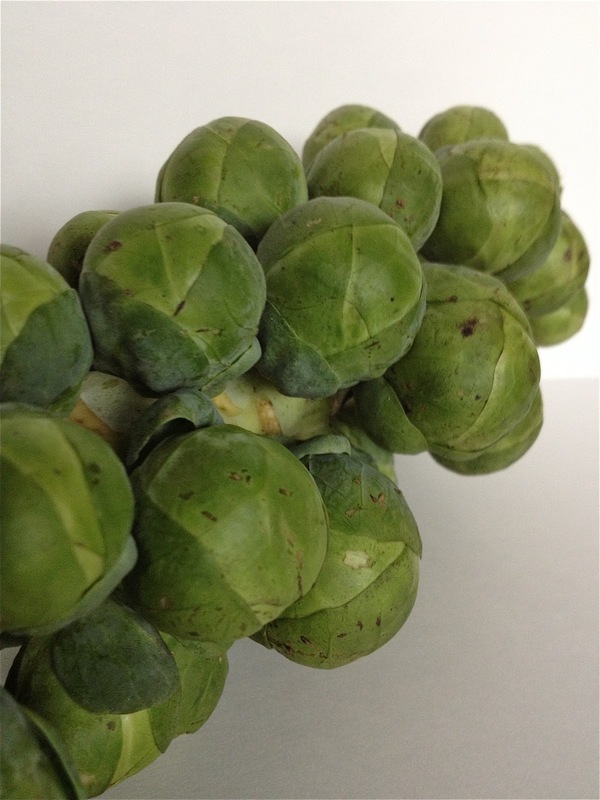 Like all variants of cabbage, Brussels Sprouts taste AWFUL when overcooked to the point of mushiness. So don’t do that. Don’t do that to any vegetables. Especially the green ones, because overcooking breaks down their nutrient content. I bought my sprouts on a pre-holiday sale. They came on a stalk, which I thought was really cool. They seem fresher like that, and the sprouts were all similarly sized, making cooking a lot simpler. Bonus: The stalk doubles as baseball bat. This recipe flavors the sprouts with fish sauce, which is a Thai condiment made from fermented anchovies. I avoided fish sauce for years because “fermented anchovies” does not sound appetizing, especially to a fish hater like myself. However, fish sauce doesn’t really taste that fishy. It actually tastes like richer, more complex soy sauce. It is very salty and a little bit goes a long way. If you’re a vegetarian, or I haven’t convinced you that fish sauce is worth trying, use soy sauce instead. Bring a large pot of boiling water to a simmer, and have a bowl of very cold ice water at hand. 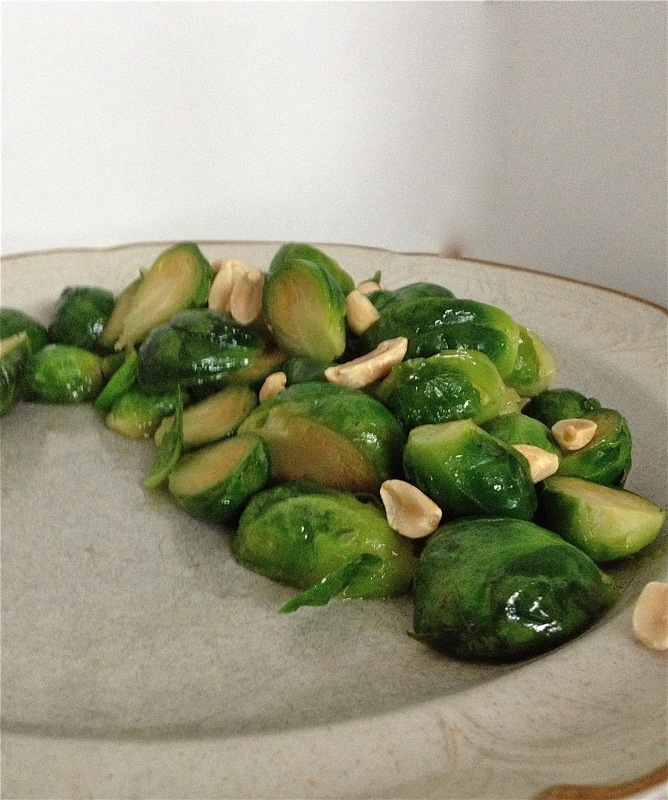 Carefully place the brussel sprouts into the simmering water and blanch. (You want them to be slightly tender. This took my small sprouts 3 minutes. Err on the side of undercooked!) Remove the sprouts and place in the bowl of ice water. Dry on paper towels and cut each sprout in half. Heat about a tablespoon of oil in a frying pan over medium high heat. Add the sprouts and the fish sauce. Cook, stirring occasionally, until sprouts are heated through and browned a bit (about 4 minutes). Remove to a serving platter. Sprinkle with lime juice and peanuts. Source: Adapted from this recipe from The Kitchn.